It’s 1985, and Gerald Deas A.K.A. “Dr. Deas,” a medical doctor, poet, playwright, and musician wrote a poem entitled “Felon Sneakers” warning against the perilous dangers of young men getting too enamored with sneaker culture. “If an unlucky brother winds up in jail,” warns Deas, “his felon sneakers can’t get him bail.” Rather than serving as the cautionary tale that cajoled young men across America into loafers, the poem sparked a passionate response from one of the most explosive rap groups of the late ’80s. 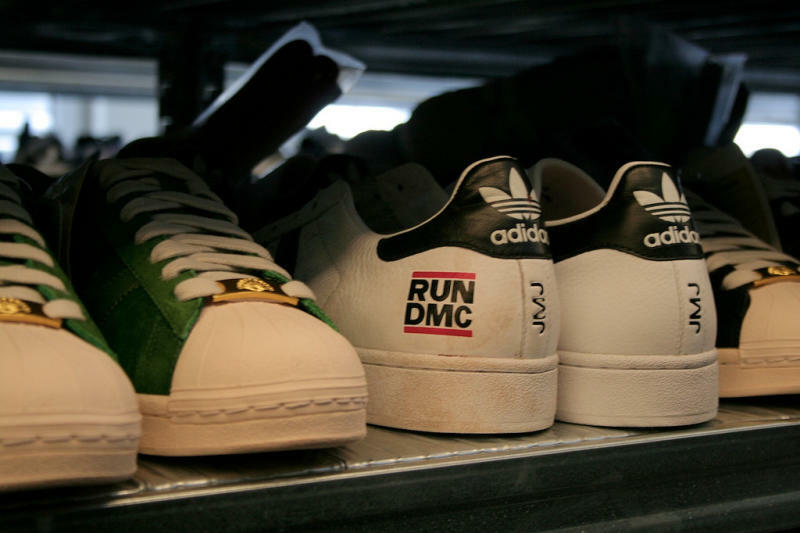 The following year Run-D.M.C’s stone-cold classic, “My Adidas”—would go on to turn the German sportswear brand into an intrinsic part of hip-hop culture. And so, an adidas flag was planted in the rap world. View our full adidas collections here. It was all a long way from adidas’ origins—the running shoe that first bore the name in 1949 (always lowercase) and the dreistreifen, a simple aesthetic touch of three parallel lines that would prove to be a masterstroke. Way before people were rocking gold rope and shell-toes with no laces, the product of German visionary Adolf “Adi” Dassler—he who hacked off and smashed together his name to create the brand we all know and love today—had a reputation for class, craft, and sporting excellence. Athletes everywhere knew where they stood once they got their hands on a pair of adidas kicks. The Superstar itself started off as a low-profile basketball shoe in 1969 and was soon brought to national attention by legendary NBA center Kareem Abdul-Jabbar. Bringing comfort and stability to basketball players who’d been use to the unforgiving structures and no-give soles of previous shoes was a huge step in the right direction. Within a few months three quarters of the NBA were in the shoes, and over the coming years the sneaker would leave the hardwood and hit the sidewalk, eventually gaining the attention of Joseph Simmons, Darryl McDaniels, and Jason William Mizell. Today we know the members of Hollis, Queens’ favorite rap group as Rev Run, D.M.C. and the late Jam Master Jay. 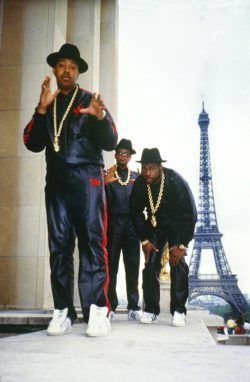 Deciding to dress for the stage the same way they dressed for the streets, Run-D.M.C.’s adoption of the shoe and subsequent counter-punch against Deas’ anti-sneaker ode earned them a sponsorship deal from adidas to the tune of a cool $1 million. This was all the impetus needed to push adidas—heritage, stripes, and that beautiful threefold logo—straight into the face of the mainstream after it had been bubbling under the surface for years. 1984’s Beverly Hills Cop had brought it close. Eddie Murphy—the biggest movie star in the world, the coolest man on the planet—did a lot to endear the brand to millions. He repped off-white adidas Country sneakers as Axel Foley in the film. The Country is a beauty: a rounded toe, wide instep, premium-leather and suede inserts that gain character and life with every scratch and scrape. It was a European staple, born from a love for games of pick-up soccer and knock-around metropolitan living brought to American eyes, and it stuck. After Murphy and the Run boys made their mark, adidas kept moving like a shark with three-striped gills. In the late ’80s, the Beastie Boys blew up speakers the world over with their snarky skater shtick and era-defining rap-rock. Wherever they went, Mike D came outfitted in a pair of adidas Campus. In 1991 a not-so-young Ice-T chased a very young Chris Rock across the streets of New York in the now-classic thriller New Jack City. Both wore adidas Phantom high-tops, proving the brand could kick it with the modern basketball crowd like the best of ‘em. 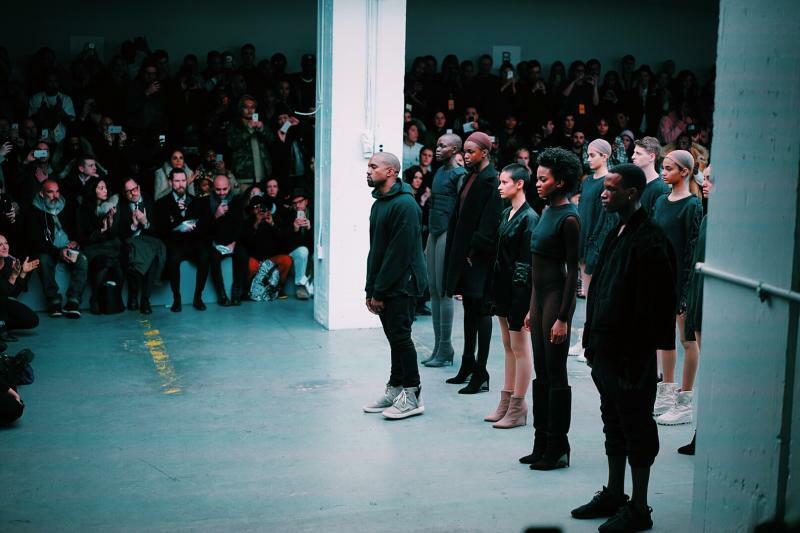 The difference was that Nikes and Jordans were for show, but adidas was for tell. It wasn’t just a trainer, but a lifestyle. And nothing defined adidas lifestyle quite like Britain in the ’90s. Widely popular rock band Oasis simply was adidas. Whatever you think of them now, it’s hard to deny the impact they had. Straight up, you know you sing your heart out to “Wonderwall,” when that joint comes on the radio and you’re in the car dolo. In their heyday, before the questionable haircuts and infighting that led to their demise, the brothers had the adidas game on lock. And they were the shining lights of England’s North West—the band’s stronghold. If adidas’ head was at their headquarters in Bavaria, Germany, its heart was in Liverpool and Manchester, England and will probably stay that way forever. And if there’s a better marker of Oasis than Noel Gallagher on stage with his cherry-red Les Paul in adidas Gazelle OGs or Liam Gallagher in a baby-blue bucket hat and pair of black Copa Mundials, we have yet to see it. The band and the brand will forever be intertwined. Boasting lightweight comfort and easy maneuverability, legendary athletes like Franz Beckenbauer made adidas hard-ground soccer shoes into instant icons of class and control. Favored to this day by soccer players and fans, silhouettes like the Gazelle, the Special, the Copa Mundial, and—yes—the Beckenbauer Allround all pay homage to the Samba and the original designs that made adidas the go-to soccer brand for the past 60 years. In the 15 years since, adidas retained a stranglehold on music—with notable collaborations from Snoop Dogg, Ciara, and a whole bunch more—but as soon as 2013 hit, they jammed their foot on the gas. A$AP Rocky’s piggyback on the winged Jeremy Scott x adidas collab proved that the brand had its finger on the luxe pulse, while Pharrell Williams took one of their most faithful silhouettes into the stratosphere. The Stan Smith is far and away adidas’ best selling shoe. Originally named the adidas Robert Haillet after the French tennis player, you guessed it, Robert Haillet. When he retired from tennis adidas looked for the next superstar to represent the shoe. Donald Dell, an American tennis manager at the time suggested Stan Smith and the rest is history. Interestingly enough the green foam padding came about in order to protect athletes Achilles tendons. After slipping out of view for a few years, the classic white-and-green colorway came back with a vengeance in the last few years before Pharrell introduced more unique Pantone colorways than any one man could ever wear. His 2015 collab went bananas, bringing an underrated and under-appreciated tennis shoe that’s barely changed since the ’60s to every sidewalk and street in America. That’s major. And then there’s Kanye West. Where even to begin with the only rockstar left on this planet? After a heavy breakup with Nike, Kanye teamed up with Germany’s finest. If people doubted his design credibility, his adidas collection did away with any questions. The pinnacle of the partnership happened with the killer outing of the beige Yeezy Boosts at August’s VMA Awards—a shoe so beautiful it has hypebeasts from Merseyside, England to Hong Kong putting their cars on sale. The white-on-white YBs he wore at Houston Rockets’ guard James Harden’s birthday party officially made his work standout, while also staying perfectly Kanye. What more could you want? The 350s for the fashion-dads and the YBs for the kids—Kanye West has cemented his place in the pantheon of adidas history, already.